Dana Dolly "Universal" kit. 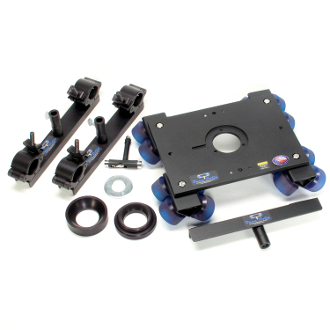 Includes: Dana Dolly, 2-"Universal" Style Track Ends, 1-100mm Ball Adapter, 1-75mm Ball Adapter, Center Support, Washer, Tool. Made in USA. Black. Will accept any size pipe or tube from just under 1 1/4" (1.66 O.D.) to just over 1 1/2" (1.90 O.D. ).